After a century and a half of diaspora, Chief Seattle’s people have one last chance to reclaim their rights—and prove they exist. As a girl, Cecile Hansen knew that Indian blood ran through her veins, but she never dreamed that she was a tribal princess. Her father was a logger and fisherman and her mother a cannery worker, and outwardly they lived much as hundreds of other blue-collar families did in the 1950s in what’s now Burien. They were devoutly Catholic and active in the church. Money was tight, so her father and brother fished to put food on the table. Every Sunday friends from various local tribes gathered at their home for a potluck dinner. Then, when Cecile was 13, her mother mentioned in the course of a casual conversation that she was the great-great-grandniece of Chief Seattle, leader of the Duwamish tribe and steadfast friend of the whites who named their city after him. At the time, the news meant little to Hansen. It wasn’t until she was in her 30s that she began to explore her heritage. Talking with elders and historians, she learned how the Duwamish, “the people of the inside,” had been displaced from this, their native soil, and driven to the brink of extinction. Reluctantly at first, she took up a century-old cause—to restore her people’s legacy, to bring them out of the shadows and back into their birthright, to make the world acknowledge the existence of this land’s original inhabitants. All evidence suggests that Hansen’s people have lived here since the last ice age ended, 10,000 years ago. Once they occupied more than 40 villages scattered from Burien almost to Everett, as far east as Lake Sammamish—the core of what we now call Pugetopolis. This strategic turf made the tribe a key player in the trade networks that ran along the West Coast, and in the region’s intertribal politics. 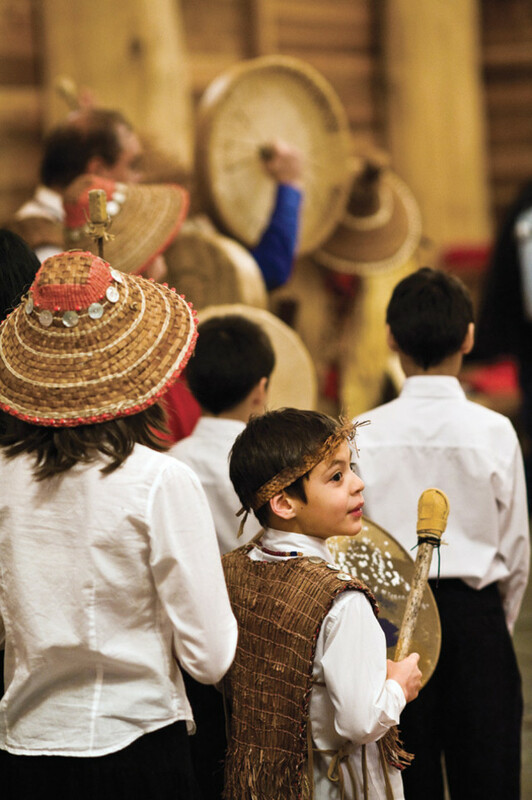 The offspring of elite Duwamish families often married the highborn of neighboring groups, creating a cosmopolitan multilingual society; Seattle was the son of a Suquamish chief and a Duwamish noblewoman. So when the first Euro-American families landed at Alki Point in 1851, Chief Seattle naturally sought an economic alliance. “The Duwamish could have wiped out the early pioneers, but fortunately they wanted peaceful relations,” says Amy Johnson, whose great-great-great-grandfather David Denny helped found the tiny settlement that became Seattle. “Our forefathers wouldn’t have survived without their help.” Denny’s group, together with Seattle and his people, built a thriving village on a plot the Duwamish called Little Crossing-Over Place—today’s Pioneer Square. They named their new town Seattle, after their benefactor. The Duwamish and other local tribes helped clear the land, supplied salmon, game, and other staples, and toiled in the sawmill that soon rose. But within a few years the newcomers came to outnumber the natives, and competition and conflict erupted, claiming white and Indian lives. Even then, many on both sides sought peaceful coexistence. But Isaac Stevens, Washington’s territorial governor, had other orders: to “unite the numerous bands and fragments of tribes into [six or eight] tribes” and convince them to give up their ancestral territory. Starting in March 1854, in a 10-month torrent of negotiations, Stevens pushed through six treaties that transferred most of Washington from the tribes to the immigrants. On January 22, 1855, his whirlwind tour reached Point Elliott, aka Mukilteo. There 82 leaders representing 22 bands inscribed their Xs, exchanging millions of acres, from today’s Auburn to the Canadian border, for guaranteed hunting and fishing rights and promised reservations, schools, medical care, and $150,000 worth of “beneficial objects” to be dispensed over 20 years. For nearly half her life, Cecile Hansen has fought for rights promised by solemn treaty 153 years ago. Some signatories recalled hearing references to buckets of gold and reassurances that their reservations would lie in their native territories. But Stevens committed no such promises to paper. The treaty actually required the scores of Puget Sound tribes to relocate to four reservations—Port Madison, Tulalip, Swinomish, and Lummi. Federal officials planned to merge these later at Tulalip and eventually pack all the territory’s natives onto the Yakama Reservation east of the Cascades. Resistance paid off for the upriver Duwamish; they retained part of their traditional lands as the Muckleshoot Reservation. Seattle’s people, the downriver Duwamish, whose lands lay in the settlers’ paths, were not so fortunate. The government insisted they join the other reservations. Most refused. They were shuffled to a temporary reservation at Port Madison on Bainbridge Island but, being river people, soon decamped to the mouth of the river they knew and the salmon runs that sustained them, at Holderness Point (now Duwamish Head) on Elliott Bay. Officials bore down, and the Duwamish diaspora began in earnest. Still the Duwamish pushed for their own reservation and, in 1866, they nearly won it. Citing the need to correct deficiencies in the Treaty of Point Elliott, the U.S. Superintendent of Indian Affairs proposed establishing a 640-acre reservation along the Black River in today’s Renton, where 275 Duwamish already resided. But settlers had already discovered coal there and would never relinquish such a bonanza. More than 150 petitioned against the reservation plan, contending it would do grievous injustice to “the quiet and flourishing [white] settlements along the Black and Duwamish rivers” to grant territory that was “of little value to the Indians” anyway. Even two celebrated friends of the Duwamish, Doc Maynard—who led the drive to name the city after Seattle—and David Denny, signed the petition. 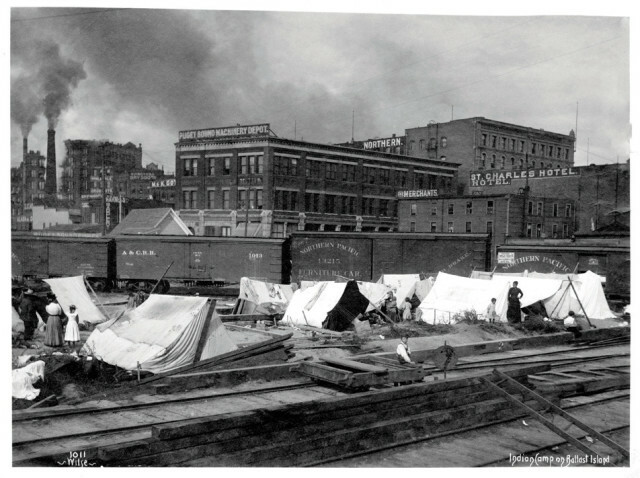 Displaced: The Duwamish camped on Ballast Island in Seattle’s harbor, circa 1900. Landless and impoverished, the tribespeople hung on. The city grew up around them and pressed in on them. Some starved along the river that bears their name, after its salmon streams were diverted. Others fled after settlers torched their remaining longhouses. Many died in the great flu epidemic of 1919. But despite their dire circumstances, one group of Duwamish hired an attorney in 1916 and tried yet again to secure a reservation. They alleged their people hadn’t actually been represented at the Treaty of Point Elliott signing, but couldn’t prove that the treaty signatories (i.e., Chief Seattle) hadn’t been authorized to speak for them. Their suit was dismissed. That same year the completion of the Lake Washington Ship Canal drained the Black River and wiped out the last known Duwamish village. At that point, the U.S. government maintains, the tribe ceased to exist. But still the Duwamish endured. Some retreated upriver, and one band moved to a one-acre plot in Renton that a friendly settler had deeded to a Duwamish chief. Several women wedded settlers, carrying on the tradition of marrying powerful neighbors. In 1925 the leaders of several tribes hired an attorney and filed a joint claim for their lost lands. Nearly half a century later, 1,000 tribal members netted $64 apiece. In the early 1970s the Duwamish became embroiled in another legal battle. State fisheries officials began sporadically arresting Indians for fishing in local waterways, setting off an escalating cycle of public demonstrations, police raids, and violent clashes between tribal and commercial fishers. Cecile Hansen’s older brother Manny Oliver, a tribal leader and lifelong fisherman, was repeatedly fined and occasionally arrested for casting his nets in the Duwamish River. Inspired by his activist example, Hansen took up the cause and was soon elected to the Duwamish tribal council. The Fish Wars ended in 1974 when U.S. District Judge George Boldt affirmed Indian fishing rights and awarded half the salmon catch in Puget Sound to the treaty tribes. But this victory proved hollow for the Duwamish, Snohomish, Steilacoom, Snoqualmie, and Samish tribes. Boldt shut them out of the settlement, dismissing them as political nonentities with no treaty rights. Several years later, Boldt was found to be suffering from Alzheimer’s disease, and the Duwamish cited his impairment in an effort to get his decision overturned—a legal long shot that fell short. Boldt’s decision stood as a precedent for future rulings on tribal status. For the Duwamish the end of the Fish Wars marked the beginning of a long and bitter fight. Cecile Hansen was elected tribal chairwoman in 1975. She was a young mother with five children who had served only two years on the Duwamish council, and her limited experience made her shy away from the honor. But her brother Manny, who had had to join the Suquamish Tribe and relinquish his role in the Duwamish in order to continue fishing, convinced her to accept the position for the tribe’s sake. Three options remained for the Duwamish: sue the government, lobby congress, or resign themselves to extinction. What Hansen thought would be a three-year task became a 30-plus-year crusade. Decades of wrestling with red tape and recalcitrant officials show in the crinkles around her eyes, which grow sad when the talk turns to her people’s struggles, but a hardened determination underlies her soft features. She has been to court more times than she can count. She has testified, vehemently, before the U.S. Senate Committee on Indian Affairs and knocked on the doors of every congressman and other politician for 30 miles around. Hansen and her people spent more than a decade and thousands of dollars assembling evidence that they had maintained a distinct identity since their first contact with Euro—Americans. They waited another decade for a decision from the Bureau of Indian Affairs. Finally, in 1996, it denied their petition, finding that they failed three of the seven tests for recognition: They lacked a statelike government, a community distinct from mainstream America, and a historical connection to the aboriginal tribe. Fighting on meant appealing the official determination. A small army of researchers and volunteers labored for a year and a half, combing newspaper archives and tribal members’ papers for references to Duwamish participation in potlatches and other traditional gatherings. They prepared intricate genealogy charts to rebut the finding that today’s Duwamish are not a continuation of Seattle’s tribe. And they undertook historical studies documenting the hierarchy of chiefdoms that governed the Duwamish and other Puget Sound Indian groups—the independent political structure the government claimed did not exist. At the start of 2001, the Duwamish feared even more resistance under soon-to-be President Bush than they had faced under Clinton. On January 19, 2001, the day before Bush’s inauguration, Hansen frantically called every federal agency she could think of, even the White House, checking on the status of the tribe’s petition, but none responded. At day’s end she was almost out the door when the phone rang. It was the director of the Bureau of Indian Affairs’ Branch of Acknowledgment and Research, a panel of academics that evaluated Native American organizations’ petitions, with news Hansen had waited more than two decades to hear: The United States was officially recognizing the Duwamish Tribe. Word traveled fast; tribal members poured into the office, champagne flowed, and the partying continued into the night. The jubilation was short-lived. Less than 48 hours later, the tribe received a half-legible fax from the BIA stating that its status had been suspended pending review. Nine months later the agency revoked the recognition and declared the Duwamish extinct. Four other tribes nationwide, including the Chinook in Southwest Washington, suffered the same fate. Such a reversal was unprecedented in the history of Native American dealings with the feds. It was triggered by charges that Michael Anderson, the BIA assistant secretary who granted recognition to these tribes in the waning days of the Clinton administration, had disregarded staff recommendations in order to promote his own political agenda. Indeed, Anderson believed the federal acknowledgement process was too burdensome and that it unfairly penalized legitimate groups like the Duwamish. And at the last minute, with no hope of changing the process, he went around it. During the inquiry that followed, a procedural flaw came to light: In his rush to approve the petitions, Anderson neglected to sign one boilerplate document. The next day, the first of the Bush administration, he returned and illegally signed the final paperwork, which an ex-colleague brought out to his car. (Anderson was later charged with abuse of power but never prosecuted.) Two days later, when Hansen learned a technicality had cost the tribe recognition, she cried and cursed. Now she calls that period “a dark time” and diligently avoids reflecting on the painful memory. Three options remained for the Duwamish: sue the federal government, lobby Congress, or give up and resign themselves to eventual extinction. Giving up was unthinkable, and a lawsuit would take years and a million-dollar war chest; Hansen hoped the legislative route would be speedier and cheaper. She enlisted Congressman Jim McDermott, who introduced a bill to recognize the tribe in 2003. “It’s a question of equity and social justice,” says McDermott. “To deny the Duwamish recognition is unjust. But we’ve had a hard time getting any hearings on the issue.” Session after session McDermott, a member of Congress’s Democrat minority, sponsored legislation to recognize the tribe, and session after session year it died in committee. Meanwhile, the clock ticked down on the deadline to file a lawsuit. Once again the tribe’s prospects grew dim. Then, in 2006, Hansen received more sad news. 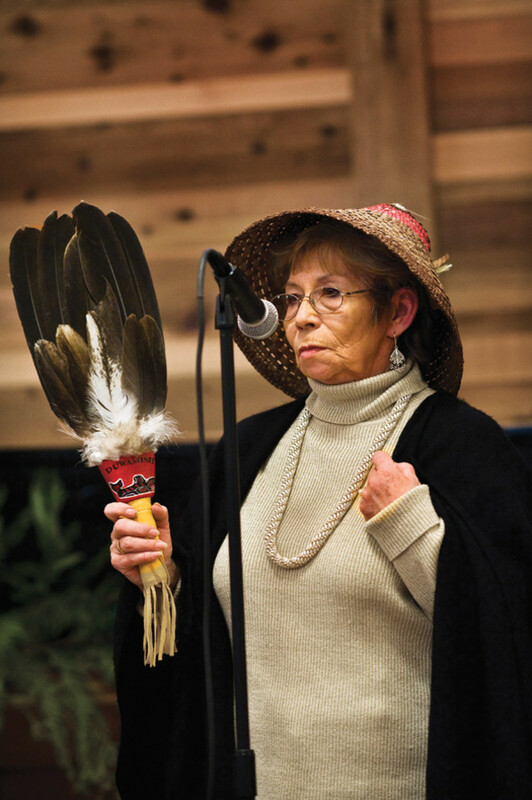 Her dear friend Ken Hansen, the chairman of the Samish Tribe, had died of heart problems and complications related to diabetes. Warriors in the same bureaucratic battle, the two Hansens (who are unrelated) had grown close over the years. Unlike the Duwamish, however, the Samish, based in Anacortes, chose to fight in court. 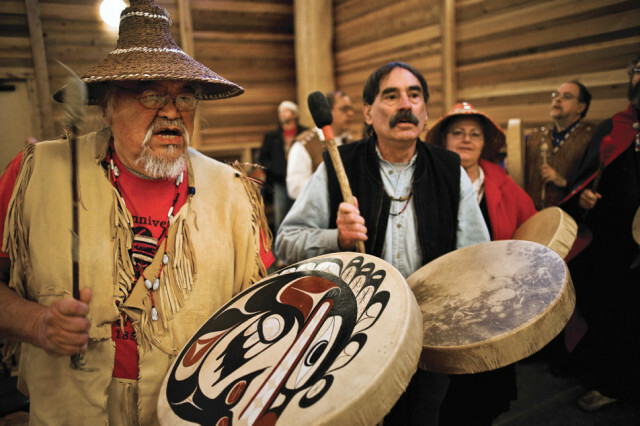 After 16 years, a judge ruled that the “protracted and tortured history” of their quest was made “more difficult by excessive delays and governmental misconduct”—and affirmed the Samish’s tribal status and treaty rights. Ken Hansen was outraged that his Duwamish friends had not received the same affirmation: “I think he felt the Duwamish would be the first to be recognized,” says Duwamish tribal attorney Scott Wheat. And he decided to do something about it. On a scorching summer day a few days before his death, Ken Hansen, enfeebled but unbowed, sat with two longtime friends, attorneys Scott Crowell and Judy Shapiro, sharing his vast knowledge of federal recognition law. At the end of their conversation, he asked a single favor: that they help the Duwamish also gain federal recognition. Shapiro and Crowell agreed, and Wheat joined them on the case. At Ken Hansen’s memorial service they met Cecile Hansen. “We were outraged by the predicament the Duwamish find themselves in,” says Wheat, “and we felt honor bound to help them out as he requested.” They agreed to take the Duwamish case without pay. This month, represented by Wheat, Shapiro, and Crowell, Cecile Hansen will square off against the federal government at the U.S. District Court in Seattle. It may be her people’s last shot at legal recognition. Their case will turn on whether Clinton appointee Anderson erred in approving the tribe’s petition or Bush appointees erred in overturning it. In their suit, the Duwamish accuse the Bush administration of denying the Duwamish due process by failing to conduct a formal hearing on their petition, of unlawfully rejecting sound evidence and analysis, and of bowing to political interests. They will note that Bush’s first Interior Secretary, Gale Norton, and Congressman Frank Wolf, a Virginia Republican and ardent longtime opponent of tribal gaming, pushed for the investigation of Anderson’s action. “The decision to recognize or not recognize a tribe is an adjudicatory function, not a political function, and should be based on the record, not on whether the Democrats or the Republicans are in power,” says Wheat. On a snow-heavy day last December, tribal members from around the state braved icy roads to join Hansen and her people in inaugurating the Duwamish Longhouse and Cultural Center. The 6,000-square-foot building was finished in gleaming Alaskan yellow cedar. Inside its vast meeting hall, thousands of end-grain fir, cedar, and hemlock blocks inlaid in the floor formed a star flanked by the Olympic and Cascade mountains, representing the meaning of the name Duwamish: “the people of the inside.” Dressed in cedar-bark vests and hats, red capes, colorful blankets, and other tribal regalia, the People of the Inside and their guests gathered around the center of the floor. 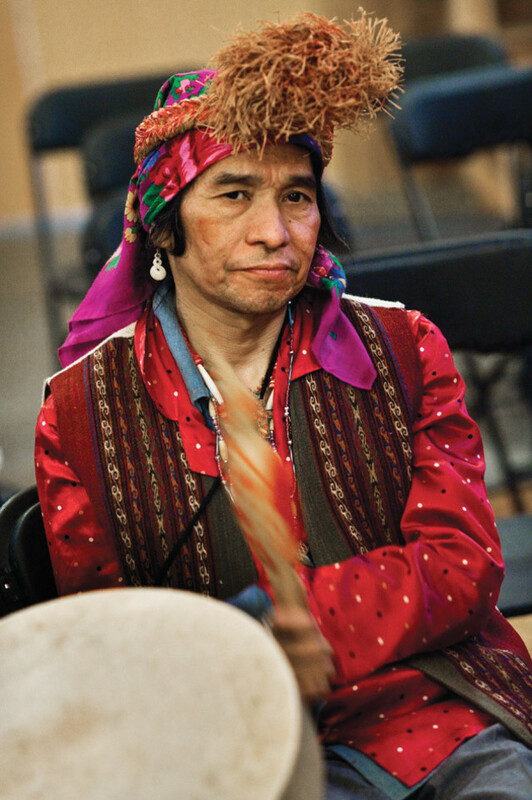 There the renowned shaman Johnny Moses, who is part Duwamish, stood alone, summoning the spirits in a mixture of English and native Lushootseed. As he finished, the crowd began chanting and beating buckskin drums painted with bright insignias. Moses performed the blessing ritual. The voices grew louder. He danced slowly around the hall sprinkling eagle feathers, a gesture of high respect.